Dragging windows across the screen. Clem (intel) Subtle improvements introduced by 397. Windows feel a bit lighter, as if they carried less weight when dragging them around. Elastic effect with pointer isn't really affected. Clem (nvidia) Same as with intel. Selecting code and scrolling in Visual Studio Code. Clem (intel) No difference between 4.0 and 397. Clem (nvidia) Same, no visible difference. Tile zone preview animations starts from the center of the first monitor. Drag a window to the right monitor and go near its left edge. The tile zone animation should start from the edge and towards the center of the right monitor. Instead it starts from the center of the left monitor and towards the edge. result: right terminal moves as you try to move the left terminal. It's not clear how to reproduce this bug 100%. It would happen pretty fast after using the desktop and switching between windows. With effects enabled on windows and dialogs, open a terminal and type "pkexec xed", observe corrupt looking dialog, where content and title look squashed. Same thing when running ./test from the mintupdate project. Partly fixed by 453. Windows now look correct but their mapping animation happens in two times. A simpler way to test this is to change the cinnamon window settings, to use the mouse wheel to change window opacity. click show desktop twice to turn it on then off again. nemo window is now 50% opaque, and reacts to all opacity changes properly. Invoke nemo with WinKey + E, right click GWL to tell Nemo to switch to the other monitor, nothing happens. Observed by @JosephMcc. We don't know how to reproduce it. 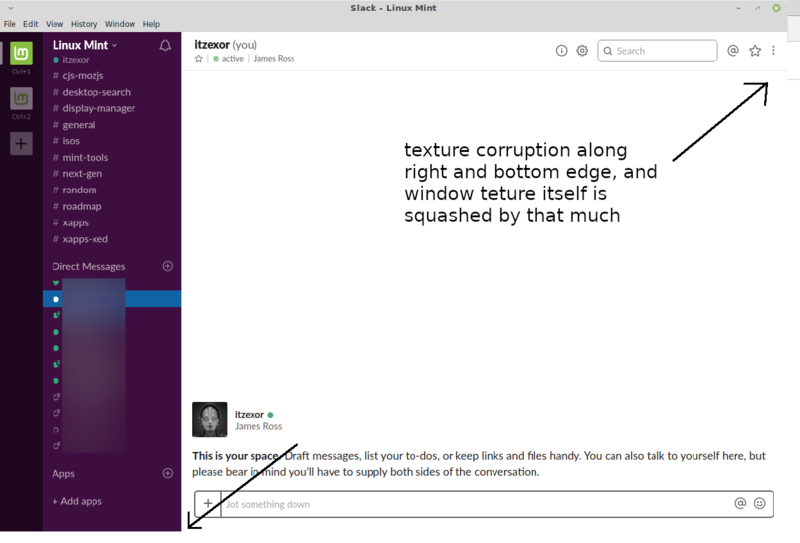 Often upon unminimizing slack: (edit: it's hard to see the bottom corruption because it's pure white and there's a white background here. it's not always white, usually just garbage). Using proton 3.16-8 Beta in Steam. Possibly the same issue. Launching Ticket to Ride using proton in Steam, the game window appears behind the other windows and the music plays but the window shows no content and the game can't be played. Introduced by 410 as well. There is also an issue with changing MetaWindowActor opacity. It doesn't work until certain conditions are met, which makes Map/Close window effects look wrong. The condition I've found that makes it work is toggling show desktop. The window tiling chrome occasionally gets stuck on screen. The small bars indicating a tile zone and the snap dialog. I can't reliably reproduce but when in happens these will stay in place no matter where you move the window until the mouse button is released. That's when you drag with the mouse? Is it the tiling preview (i.e. the area which the window will occupy), or just the border preview (i.e. the smaller area which represents the border)? When you drag with the mouse, yes. And it's the small tile zone indicators and snap dialog. Happened to me a few times, while having maximed Chrome over maximized Spotify. In Chrome, I would see that same right hand area corrupt, and I could see a portion of the underlying Spotify Scroll bar, that should be covered by that portion of the chrome window instead. @antonvalletas which build introduces it? thanks @brownsr I'll add that as issue 10. Issue 5 should be fixed by linuxmint/muffin#437 but it is WIP. Not reproducing 7 or 8 on 437, but not sure I could on master either. It looks like the shadow doesn't update as quickly as the texture does when clicking "Install Updates" in mintupdate, after expanding the dialog by clicking "Details". I can't reproduce it in Xed though, and it might not be the same issue - it's just the only hint of shadows misbehaving on my end. I'm testing on Nvidia, AMDGPU, and Intel graphics on three machines. I suspect the cases where people have different behaviors from the compositor comes down to which applications they are using. Some apps may be making muffin paint more or less. For instance, Chrome seems to cause the propagation of a lot of updates so it speeds up the redraws for all windows. So in the interest of figuring out more ways to reproduce some of these, it might be useful if you guys are able to summarize which applications are currently open when these are happening. Typically, I will have slack, vscode, insync, mintupdate, and chrome running. Also reproducing the skyrim issue. It looks like the window just isn't painting. Currently in the process of bisecting linuxmint/muffin#410 this week. @antonvalletas Are you using system title bars in Chrome or the CSD decorated window (default in Google Chrome)? @jaszhix Yes, I am using system title bars in Chrome, with the Arc-Dark theme if that is of any help. Just to clarify, linuxmint/muffin#397 depends on linuxmint/muffin#410, so the 397 deb includes that. I commented out the part of the code in the 397 branch that causes issues without 410, and built a standalone 397. Do note, to make this work without 410, this will have an issue with the cursor icon being incorrect when entering the title bar area of windows, and does not include the fix for the wrong window being grabbed during dragging. This should be installed with the version of Cinnamon included in 427-8003.zip. The tile/snap preview and osd hangup can be reproduced (not entirely reliably but like 1 out of 3 or 4) by dragging a window to an edge and waiting long enough for the osd to appear. Quickly drag the window away from the edge. Like I said, it's not reliable but should be able to reproduce. I noticed while testing above, if you tile a window, then drag it ever-so-slightly, as if you're going to break it loose, you'll trigger the tile hinting/osd again. another bug, zoom stops working consistently. Typically the first zoom step tends to do odd things like a random translation of the screen. Tends to be better after the first zoom in step as you zoom in further. Introduced in the 410 build. I can now see the same random translation happening in earlier builds, this may well be a pre-existing quirk. So it's not an issue with this set of changes. Sorry for the misleading report. Can't reproduce 9 (intel - hidpi) - I tried with and without vsync fwiw. I closed all of my remaining PRs because things are getting too personal on the Slack. I'm taking a break for my mental health.